These days, many restaurants can’t get by on a simple menu. The truly interesting restaurants are mixing it up more and more. We call this kind of culinary mix-up “fusion.” As one of the most diverse states in the country, fusion happens between different culinary traditions in Texas all the time. From Japanese and Chinese to Korean and Mexican, here are the best fusion options in the state. Kuai has three Dallas, Texas locations. They fuse Asian flavors of all kinds, including Japanese, Chinese, Thai, Korean, and Vietnamese in a quick-served but never microwaved fashion. Order online or stop in to any of their locations for a great meal. Yoshi Asian Fusion combines several kinds of Asian-inspired dishes to create a wonderfully authentic meal with an American twist. The Asian fusion menu includes fried rice and noodle dishes, teriyaki and tempura dishes, udon, and much more. Fusion Kitchen is another Asian-inspired restaurant, although this time in an all-you-can-eat style. They specialize in Korean barbecue and flavored hot pots, in addition to kitchen prepared foods. Come early, as there’s often a line. Japaneiro’s has been in Sugar Land, Texas for the last 14 years. During that time, they’ve cemented themselves as the go-to spot for sushi and Asian/Mexican fusion dishes. Start the meal off with tajadas, a sweet fried plantain, and finish with a roll of sushi. Fusion Peru combines well-known Peruvian and Mexican dishes and flavors. Their Peruvian specialties are all fantastic and include dishes like Peruvian tacos, salmon burger, and more. Don’t forget to add a side of Fusion Sauce. 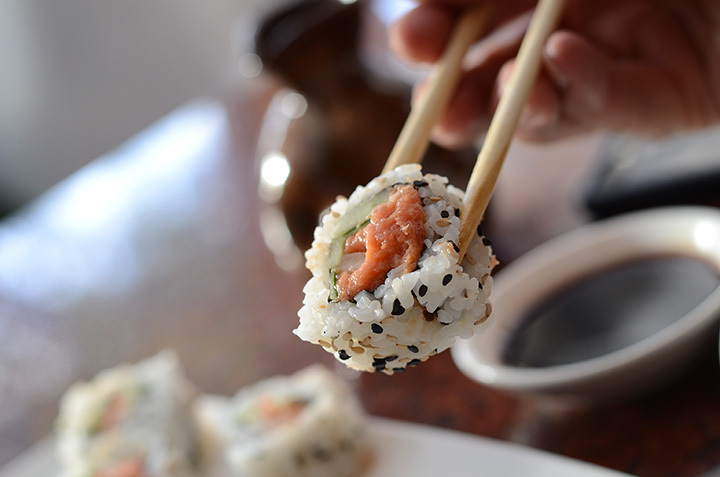 Asian Fusion in League City offers scrumptious Japanese and Chinese fusion dishes. They’ve got appetizers, soup, ride, lo mein, platters, sushi, and lunch specials. They’ve made online ordering easy, so there’s no excuse not to try them out. Gogi Street serves traditional Korean barbecue with non-traditional toppings. Get your bowl with almonds, pineapple, or avocados— all flavors you won’t normally find in Korea. Their ramen is worth a try, too. If Q-Shi Bistro sounds familiar, it could be because they were recently featured on an episode of "Diners, Drive-Ins, and Dives." The chef/owner combines his southern barbecuing roots with his love for Asian flavors. Go for the barbecue wings, kimchi fries, or a slow-smoked southern style barbecue. The Peached Tortilla was founded to provide traditional southern comfort food with an Asian twist. That’s why you’ll see fried chicken nights on Wednesdays and ramen nights on Thursdays. Their menu is full of street style taco dishes with a mashup of wonderful flavors along with imaginative entrees. Chi’Lantro grew from a single food truck to having seven locations scattered throughout the greater Austin area. Their mission? To become the Chipotle of Korean food, while mixing in Mexican flavors. Build your own bowl of barbecue or get something off their signature menu. You can’t go wrong.